We arrived in Honolulu mid-afternoon, fresh off an intense few days of birding in Kauai. We were faced with our first real taste of “urban life” since arriving in Hawaii ten days earlier, as we made our way through the city traffic to our hotel. 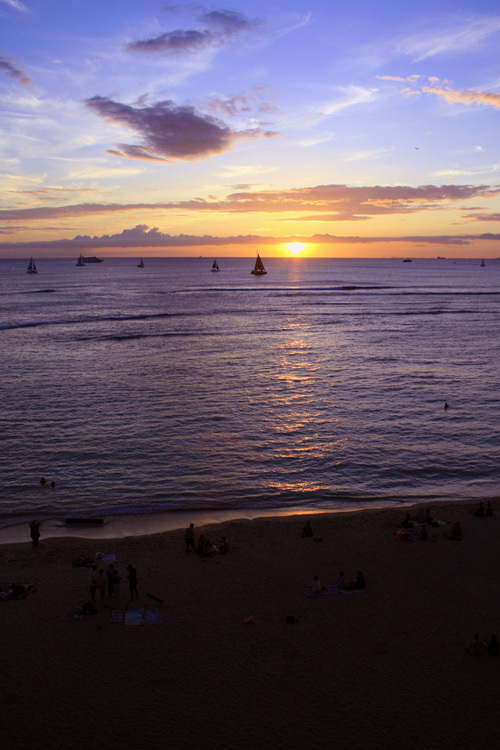 It was worth the drive, since we found ourselves at a beautiful beachfront hotel in scenic Waikiki. 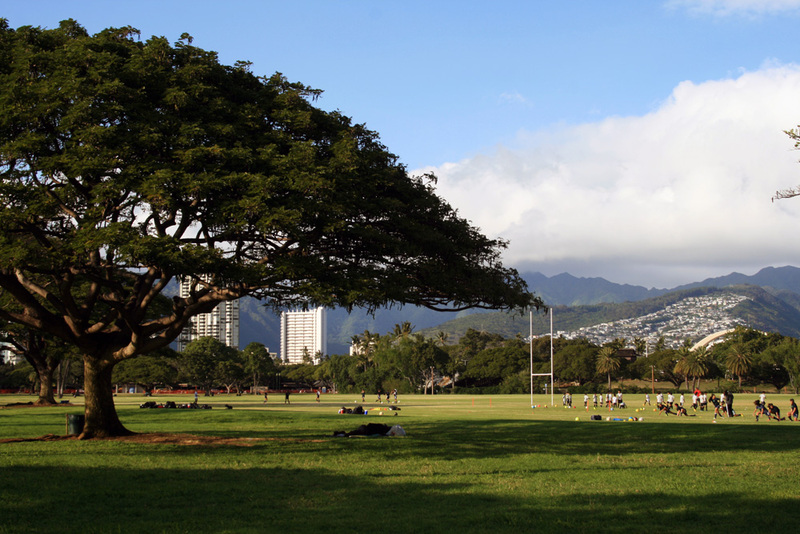 Kapiolani Park offers some wonderful birding, right in the middle of beautiful Waikiki, Honolulu. 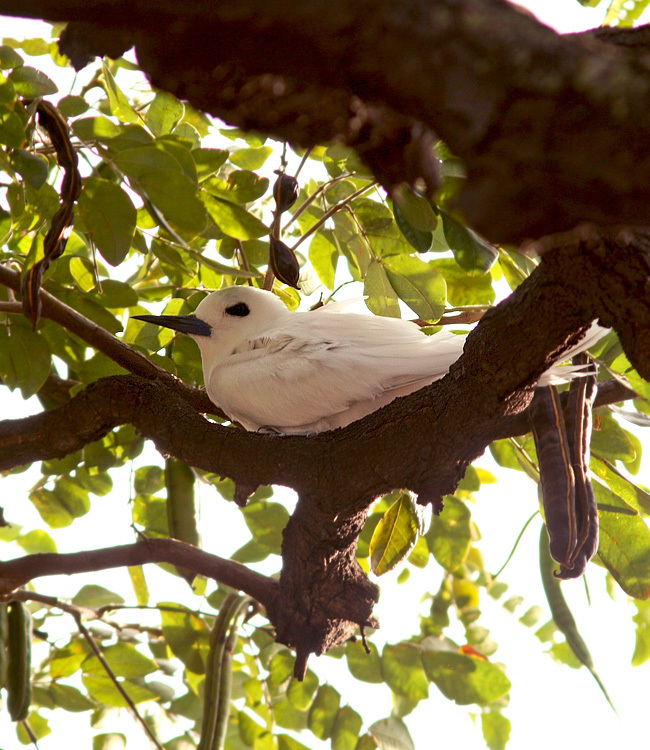 This White Tern chick, nearly ready to fledge, was found nestled on a branch in Kapiolani Park – one of only a few places where these stunning birds nest in Hawaii. We wasted no time getting down to birding, heading out for a late afternoon stroll in Kapiolani Park. Our main target was White Tern, which nest very locally in just a few parks around the city. We were fortunate to see nearly a dozen adults flying around overhead, purposely heading back and forth between the nearby ocean and their nest sites hidden throughout the area. A surprising number of white (feral) Rock Pigeons complicated our search for tern chicks, but Jody’s keen eye managed to find one nestled on a high branch along the park’s boundary. The chick was surprisingly large and probably ready to fledge at anytime. We also enjoyed great looks at about 18 beautiful Rose-ringed Parakeets, which have also taken up residence in the park and nest in some of the taller trees. 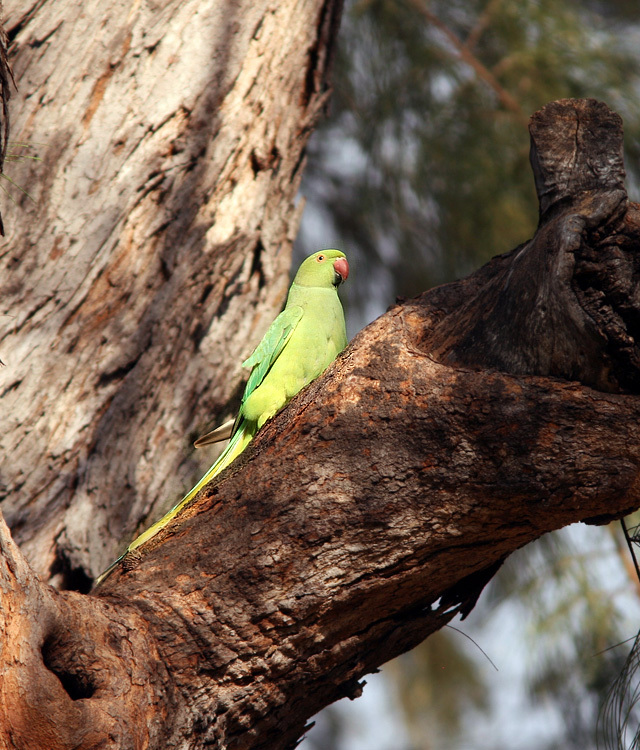 Rose-ringed Parakeets, which were introduced to the Hawaiian Islands as escaped cagebirds, are well established in some parts of Honolulu. A large flock of Common Waxbill was feeding in the grass while kids played soccer just metres away, and Yellow-fronted Canaries were doing the same at the other end of the park. A handful of Red-vented Bulbuls, Red-crested Cardinals and Java Sparrows added some extra flavour to our walk, along with more familiar species like House Sparrow, House Finch and the ever-present Common Myna. Several Cattle Egrets coursed around on the park grass, while Pacific Golden Plovers scoured the beach during our walk back to the hotel. We ended the evening with a wonderful Japanese dinner. 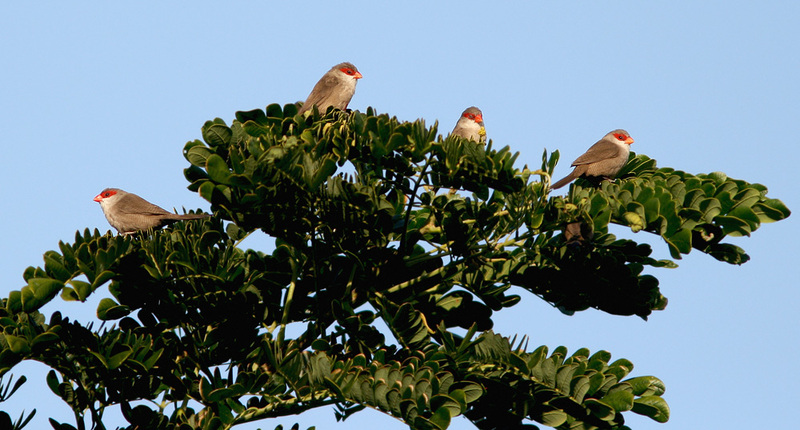 A large flock of Common Waxbill were foraging in the centre of Kapiolani Park, offering by far the best views we had of this species in Hawaii. 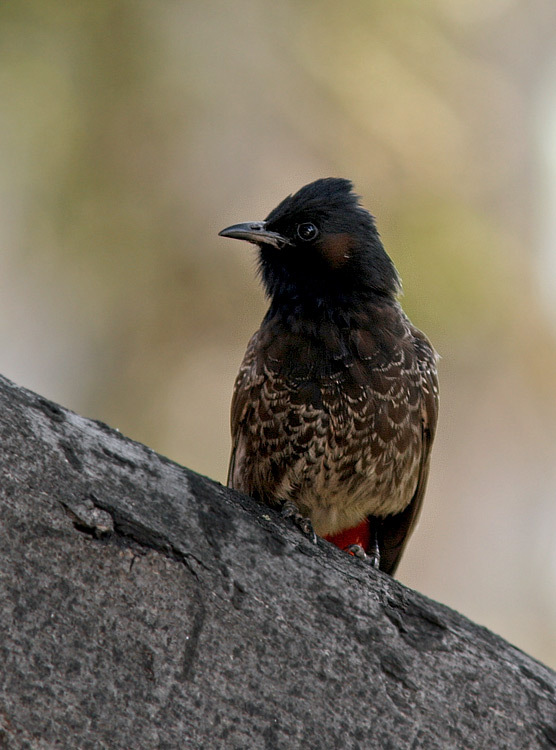 Red-vented Bulbul is another introduced species that is now well established on Oahu, and is often considered an agricultural pest. 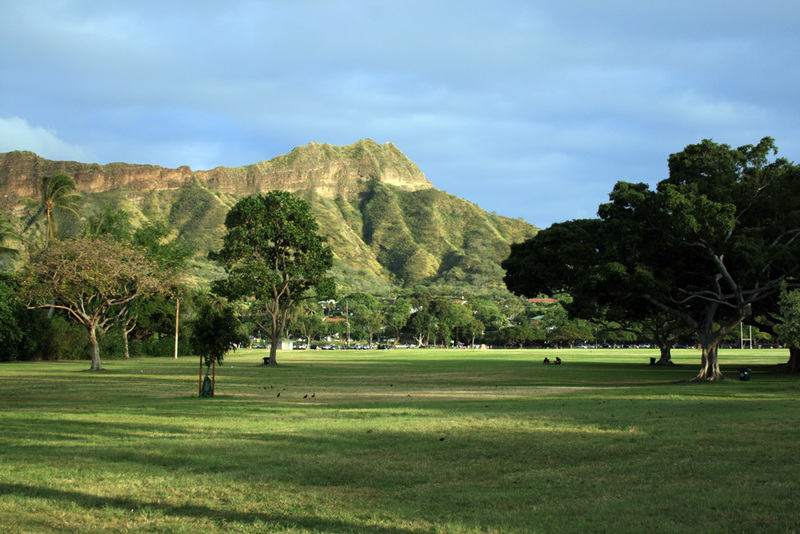 Diamond Head, on the western edge of Waikiki, is seen here from Kapiolani Park. Fueled by an equally excellent Hawaiian breakfast, we began the next morning with a hike on the Kuli’ou’ou Valley Trail in Honolulu.This popular trail meanders through a steep river valley and into increasingly native forests (something that is especially scarce on Oahu), where several native birds also live. A key target here was the Oahu Elepaio, which is endangered and much more difficult to find than its cousins on Big Island and Kauai. We were fortunate to hear two individuals during our hike, although Jody was the only person able to catch a glimpse of one. We also heard two Oahu Amakihi, but again both were elusive and managed to avoid our gaze. We did enjoy great looks at Red-billed Leiothrix, which are usually quite secretive, as well as several White-rumped Shama, Japanese White-eye and Common Waxbill. It was a great start to our day! Bristle-thighed Curlew are difficult to see anywhere in North America, but winter at several locations in Hawaii. Great bird!! From Honolulu, we headed north towards James Campbell National Wildlife Refuge, stopping for some great fish tacos along the way. In and around the refuge, we were able to spot an awesome eleven Bristle-thighed Curlew – a sweet looking shorebird and one of the birds I was most looking forward to on this trip. 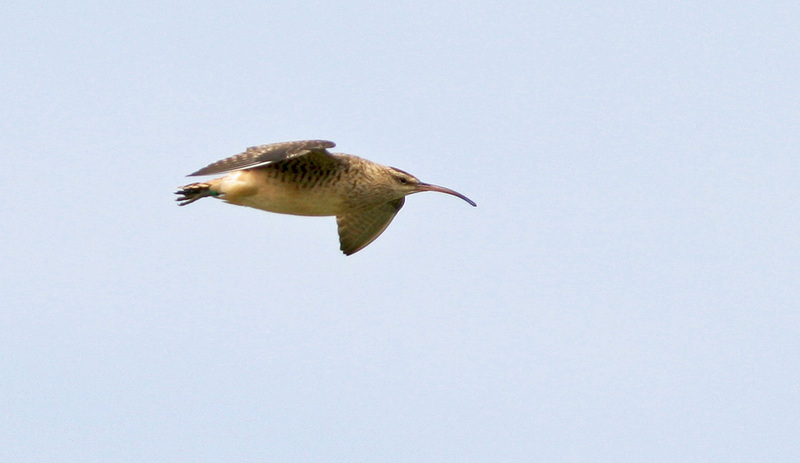 Interestingly, one of the curlews was colour banded and wearing a satellite transmitter. Other shorebirds at this location included numerous Pacific Golden Plover, a fly-by Sanderling and a Ruddy Turnstone looking very out of place standing on a fence post! Plenty of Cattle Egret, two Black-crowned Night Heron and a couple Ring-necked Pheasants were also hanging out in the area. 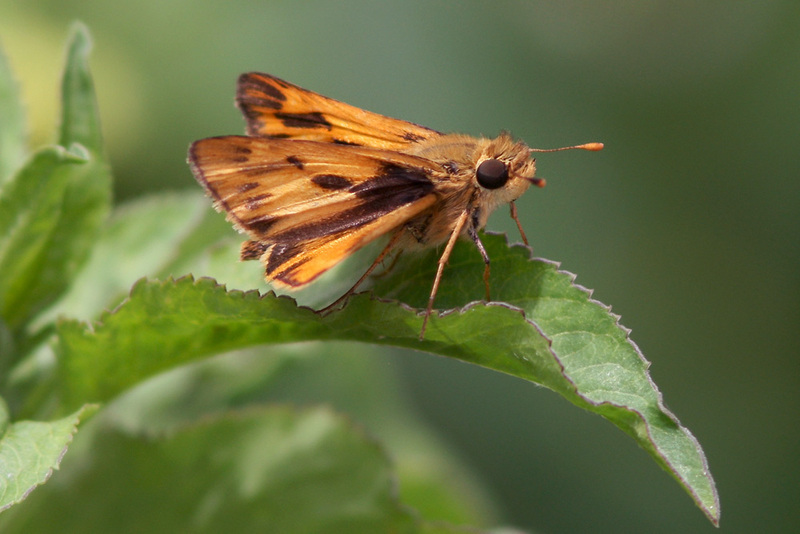 Non-bird highlights included several Fiery Skippers and a Brown Anole. 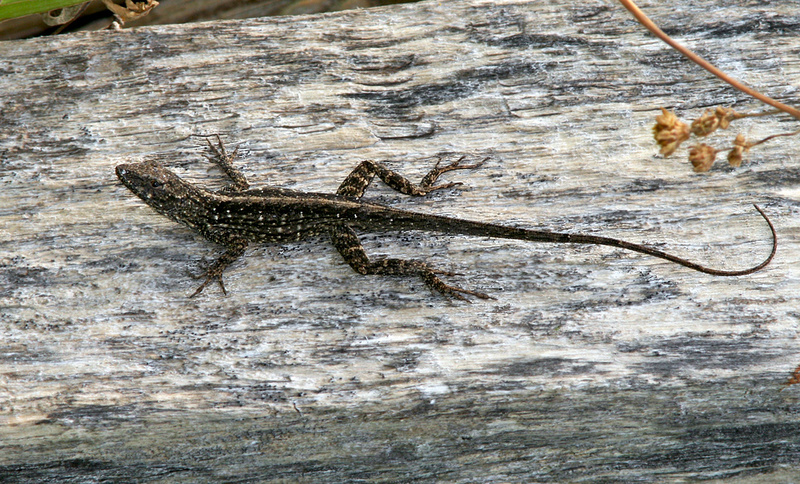 Brown Anole on the boundary fence at James Campbell National Wildlife Refuge. I have never before in my life gone ten straight days without seeing a gull, so was pleasantly surprised when we discovered a Laughing Gull at the nearby Kahuku Aqua Ponds. Any gull is a good bird in Hawaii! We also found several Hawaiian Coot, Common Gallinule and Hawaiian (Black-necked) Stilt, along with nearly a dozen Black-crowned Night Herons. 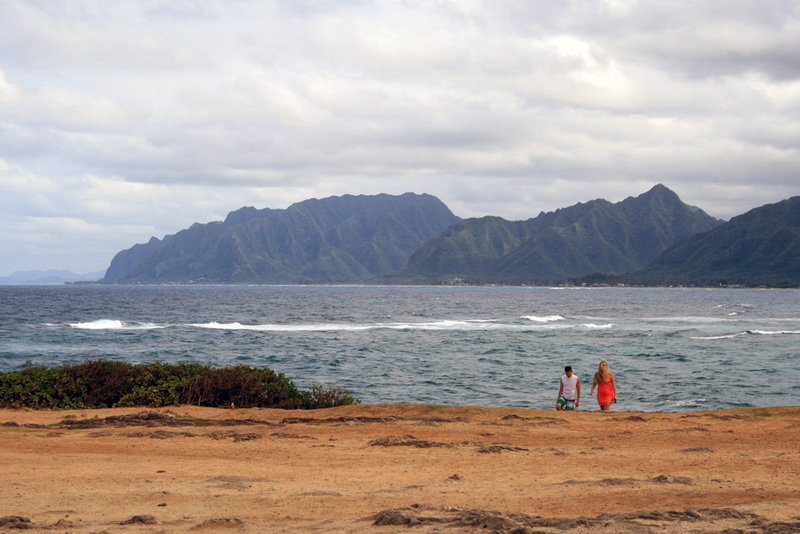 The scenic NE coast of Oahu, as seen from La’ie Point. Our last birding stop of the day (and the tour!) was at La’ie Point, where we were treated to about a dozen Brown Noddies flying by at close range, along with a handful of Red-footed Boobies coasting by offshore. However the real highlight was an adult Masked Booby that we first picked up flying north past the point, then watched for more than ten minutes as it circled and plunge-dived in the distance. Everyone was able to see this excellent bird, and it was a much-wanted “lifer” for both Jody & me!! Another memorable sighting were two Green Sea Turtles that I spotted just off the coast – their behaviour had me stumped for a few minutes until I realized they were mating, with the male clinging on to the female’s back! 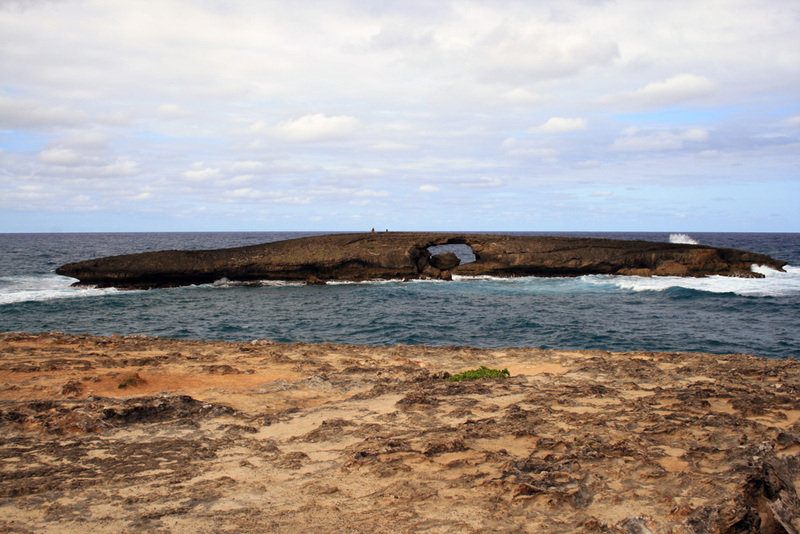 A natural sea arch lies just offshore at La’ie Point — and just beyond that we were thrilled by a Masked Booby circling and plunge diving! Jody and I ended the last full day of the tour with a cold beer, watching a stunning sunset and several White Terns flying past our hotel balcony. The tour officially ended with another great Hawaiian breakfast and a long round of heartfelt good-byes. We had been blessed with twelve days of not only excellent weather and awesome birding, but also an amazing group of people to enjoy it all with. This entry was posted in Birding Tours, Birding Trips, Hawaii and tagged Eagle Eye Tours, Hawaii, Honolulu, Kapiolani Park, nature tours, Oahu, Tours. Bookmark the permalink.